Events & discussion | Spirituality and Wellbeing | Discussion about the spirit and spirituality. Where is spirituality on New Zealand’s national health agenda? As part of the consultation on a new strategy for an ageing population, we’ve invited a range of experts and specialists to write on topics of their choice. In the following article Dr. Richard Egan and Hilda Johnson-Bogaerts consider spirituality and an ageing population. Conspicuous by its absence say Dr. Richard Egan (of the Cancer Society Social & Behavioural Research Unit, Dunedin School of Medicine, University of Otago) and Hilda Johnson-Bogaerts, Director of The Selwyn Institute (of ageing and spirituality), Selwyn Foundation, Auckland. Research, along with ‘real life’ experience, indicates the role of spirituality deserves more than just debate; particularly in the context of creating meaningful healthcare environments and establishing guidelines to help older people age well. A focus on spirituality is also closely aligned with the current development of the Government’s well-being framework. 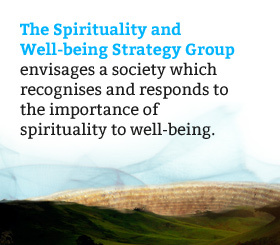 As a key dimension of well-being, spirituality needs to be included in this framework. have happier children and are more satisfied with family life. Considering these tangible outcomes, tapping into a spiritual ‘wellspring’ as part of any serious national ageing agenda is a ‘no brainer’. This is certainly our view, based on our work and experience. So, why are we not embracing the opportunity as fully as we could, or should? Part of the challenge is the many ways spirituality can be understood, along with differing perceptions about what spirituality is, fair or otherwise. For millennia, and across the full spectrum of cultures and societies, spirituality has been linked with health, healing, well-being, tradition, history and overall life satisfaction. Meaning, and connection, as part of the human condition is nothing new. We need a ‘why’ to live for, at any age. For many this is the essence of spirituality. However, until recently, in most countries and cultures the dominant practice and driving influence on the spiritual aspects of peoples’ lives has been organised religion. This convention has now been challenged, along with everything else in modern life. What people now regard as sources of spirituality have changed dramatically. When we’re talking about spirituality, what exactly do we mean? Dr. Christine Puchalski is an international leader in the movement to integrate spirituality into healthcare in clinical settings. Dr. Puchalski and her fellow contributors offered this definition in the May 2014 Journal of Palliative Medicine: Spirituality is a dynamic and intrinsic aspect of humanity through which persons seek ultimate meaning, purpose, and transcendence, and experience relationship to self, family, others, community, society, nature, and the significant or sacred. Spirituality is expressed through beliefs, values, traditions, and practices. In the context of a national focus on positive ageing, in 2010 Medscape (a leading source of online medical information for physicians and healthcare providers) published the following observation on why a re-focus on spirituality is taking place. Interest in spirituality and aging has increased recently, owing to overwhelming evidence of positive health outcomes linked to spirituality and religious participation. Increasing longevity in modern society puts spiritual needs of older adults at the forefront of societal priorities. Understanding individual spiritual perspectives becomes increasingly important, given the issues of loss, physical illness and mortality that are confronted in old age. There are multiple barriers to the proper assessment of spirituality in clinical practice and research. Integrating an individual’s spiritual practice into their healthcare can help shape personalized medical care for older adults and improve health outcomes. When understood broadly, spirituality is ultimately self-defined and experienced. However, Dr. Puchalski has identified some commonalities, as noted above. Her view is that spirituality is an inherent and fundamental component of being human. Spirituality is different from the psychological domain, which traditionally focuses on cognitive behavior, although there are obvious links. In light of this ‘renaissance’, many countries have engaged in a more serious and formal approach to understanding, debating and formulating policy on spirituality’s influence and role. reminiscence, life story, creative activities and meaningful rituals all help with the process of coming to terms with ageing and change. Closer to home, Meaningful Ageing Australia is a national body for spiritual care and ageing, set up to enable access to high quality pastoral and spiritual care for all older people in the country. Spirituality is integral to, but not confined by, religion and faith. It is about what gives us a purpose to our lives. It is about our sources of meaning and hope, which in turn are intimately related to our connectedness to ourselves, to others and to the world. There is now a large body of emerging evidence showing that pastoral and spiritual care is an essential part of holistic care. The Australian experience (and New Zealand research) shows that many people working in aged care understand the value of pastoral and spiritual care and want to have conversations around spirituality, but tend to stay at a superficial level because they don’t feel they have the knowledge or skills to respond at a deeper level. To lead and improve spiritual care, Meaningful Ageing Australia has developed National Guidelines for Spiritual Care in Aged Care. While New Zealand has the opportunity to learn from these initiatives, in some areas we are already advanced in acknowledging spirituality as part of integrated health and well-being regimens. Māori, Pacific and many religious non-governmental organisations (NGOs) implicitly, and sometimes explicitly, acknowledge and include spirituality in their work. Mason Durie’s ubiquitous model of health, Te Whare Tapa Wha, includes spirituality/wairua. This model is taught in all State schools and in professional healthcare undergraduate courses. At a policy level, cancer care leads the way, stating that “all staff working in cancer treatment services have a basic understanding of the spiritual needs of people with cancer”. Yet much of this is aspirational rather than everyday practice. Also in the area of cancer care, He Anga Whakaahuru—A supportive care framework includes guidelines, competencies and standards for spiritual well-being as part of an integrated model. Outside of these examples, references to spirituality are largely lacking in New Zealand’s health policy, professional guidelines, pre and in-service health education, standards and competencies. We would like to challenge those who are reviewing aged care, healthy ageing and the health system generally, to not only include spirituality in the policy frameworks, but to also consider the development of New Zealand-specific national guidelines on spirituality. This step would then provide the frame of reference for further understanding, and for engaging with this important aspect of the country’s health and well-being. It may go some way in further meeting our commitments under the Treaty of Waitangi, and will help us to work towards greater cultural competence across our multicultural ageing and health sectors. The goal has been set. It is our responsibility to take up the challenge, starting with including spirituality in policy, understanding people’s spiritual needs and, of course, putting this policy and knowledge into practice through meaningful and sustainable action. Dr. Richard Egan is Senior Lecturer and Co-Director of the Cancer Society Social and Behavioural Research Unit, Dunedin School of Medicine, University of Otago. Hilda Johnson-Bogaerts is the Director of The Selwyn Institute (of ageing and spirituality), Selwyn Foundation, Auckland. Te Taha Wairua – a neglected concept. In the 1980’s, Professor Sir Mason Durie introduced us to the health model of Te Whare Tapa Wha, in the context of providing relevant assessment in mental health services for Maori. This model has been widely accepted and used in many settings. I note, for example, that a study of smoking cessation in Maori also used Te Whare Tapa Wha. While this model was developed for Maori Mental Health Services, it is also applicable to non-Maori services and to anyone interested in a holistic approach to health and wellbeing. I know, for example, of Pakeha living in community, who use it as a measure of health of their community and environment. In writing this, I am considering a wide range of settings that require assessment for the purpose of promoting health and healing. The Government organisation ‘Careers New Zealand’ has published a description of Te Whare Tapa Wha, describing the four aspects of health. Te Taha Wairua is outlined as follows: “This refers to spiritual awareness. It is recognised as the essential requirement for health and wellbeing. It is believed that without spiritual awareness an individual can be lacking in well-being and therefore more prone to ill health. Wairua explores relationships with the environment, people and heritage. Spiritual awareness is key to making effective career decisions.” There could hardly be a stronger statement as to the importance of spiritual health. As with understanding any model of health, we should reflect on how this applies to us as practitioners. How would we ourselves measure up in terms of the four cornerstones of our own health? Do we, in our everyday lives, consider the importance of these four aspects of our lives to our own wellbeing? How often when we have become unwell, have we been told that we are not attending to our physical health, or to our mental health, or giving enough time to our families – a source of strength and support as well as sometimes an anxiety or responsibility? How often, however, would we consider our spiritual health in making such a self-assessment? Not often, I would suggest. If we are unfamiliar with this aspect of our own wellbeing, how can we incorporate this into our assessment and understanding of others? First of all, we have to know what spirituality means. What is the spiritual aspect to our lives? This may vary markedly from person to person, but could be considered to include the idea of our world view; the beliefs or practices that sustain us; an awareness of a life force greater than or outside of ourselves; ways that we make sense of life; what gives meaning and purpose to our lives; spiritual or religious communities that we belong to; how do we feel connected and so on. Such spiritualty may or may not include a traditional religious belief system. Aside from a possible lack of knowledge about spirituality, we seem to have a reluctance, a shyness, a lack of confidence about asking about this part of people’s lives. With an increasing secularisation of society, an ability to have a relaxed talk of God, a Higher Being or our world view seems to have sunk without trace. And yet we hear of people who have taken up meditation, attend Buddhist retreats, follow a guru who inspires them, have developed rituals within their families for special occasions, such as the naming of a child, attaining adulthood, death etc. One problem may be that we often conflate spirituality with organised religion. For those who do not practice the latter they may not recognise that they do have a spiritual aspect to their lives, whereas those who do practise may be reluctant to talk about this as society in general and, perhaps, psychiatry in particular have been dismissive of these beliefs and practices. In addition, saying that one meditates every morning is considered admirable, whereas talking about one’s prayer life and personal relationship with God may be looked upon askance. As with all aspects of medicine, one’s own experiences may affect the way we practice our skill. Putting this in context, those of us with physical problems may be very sympathetic to a fellow sufferer, be knowledgeable about available services and form a good rapport with the patient. On the other hand, if their difficulty is minor in contrast to one’s own, it is easy to belittle their distress. Similarly if we have experienced any aspect of mental illness (and, after all, we are not exempt from the statistics of 1 in 4 or 1 in 5 being likely to have at least an episode of mental distress in our lifetime), this may make us better able to empathise with the person in front of us. But what of spirituality?? If Te Taha Wairua is considered ‘an essential requirement for health and well-being’, than we are being negligent if we ignore this aspect of people’s lives. Encouraging such a conversation may be an opportunity for people to realise the importance of spirituality; to recognise the spiritual side of their lives; to strengthen the way that they develop their beliefs which anchor them in life and link them to others. New Zealand would be one of the most secular societies, yet people are searching for meaning in their lives. Sometimes they don’t know where to look or what to say, yet may already have the answers within themselves, waiting for someone to help them discover this aspect of their lives. And so to the practical ways to achieve this – making an inquiry into how much of this is taught in training programmes and what, if anything, needs to be improved; developing ways to ask about this subject, with which we may be unfamiliar – ways that do not upset or alienate people; learning from other professionals who may be more familiar with this area of assessment; committing ourselves to addressing this issue; modelling to younger practitioners that this is part of holistic care; seeking support within our professions from like-minded colleagues – in other words developing this skill as we would any other practical skill in order to treat and heal the best we can. Bridget Taumoepeau M.B. Ch.B., FRANZCP, B. Theol. An article worth reading and sharing. For some time I’ve thought there is a relationship between spirituality and self-harm / suicide. However there is very little discussion, at least at in the public sphere, about this aspect of causes. Below is another study suggesting this relationship. The influence of spirituality and religiousness on suicide risk and mental health of patients undergoing hemodialysis. Loureiro ACT1, de Rezende Coelho MC2, Coutinho FB3, Borges LH4, Lucchetti G5. Despite the large amount of literature assessing how spiritual and religious beliefs have an impact on mental health and suicide risk in various groups of patients, few studies have investigated patients with chronic kidney disease (CKD). The purpose of this study is to investigate whether spirituality and religiousness (S/R) are associated with the presence of suicide risk as well as whether those beliefs are also associated with the presence of mental health problems in patients undergoing hemodialysis. Cross-sectional study carried out in three Brazilian dialysis units involving hemodialysis patients. The study assessed religiousness (Duke Religion Index); spiritual well-being (FACIT-Sp 12); mental health – depression and anxiety (Mini International Neuropsychiatric Interview-MINI); and risk of suicide (MINI). For analysis, adjusted logistic regression models were applied. A total of 264 (80.7%) patients were included, 17.8% presented suicide risk, 14.0% presented current major depressive episode, and 14.7% presented generalized anxiety disorder. Concerning spiritual well-being (FACIT-Sp 12), the subscale of “Meaning” was associated with lower risk of suicide, depression, and anxiety. The subscale “Peace” was associated with lower depression and anxiety, whereas the subscale “Faith” was associated with lower suicide risk and depression. Religiousness measures were not associated with the study outcomes. Spiritual beliefs were associated with lower suicide risk and better mental health among hemodialysis patients. Factors related to spiritual well-being, such as “meaning”, “peace” and “faith” were more associated with the outcomes studied than religious involvement. Further studies are needed to replicate our findings in different cultural and religious settings. In an exciting new collaboration, the 2018 BASS International Conference will be a joint venture with the European Conference on Religion, Spirituality and Health (ECRSH). This is in recognition of the academic interests that BASS shares with ECRSH. The conference will be designed in a spirit of international co-operation and collegiality in the field of the study of spirituality, which is an important part of our mission. Although keynote speakers from a variety of academic disciplines and professional backgrounds will provide a comprehensive overview of this topic, papers and workshops presented in concurrent sessions need not have an overt focus on forgiveness or reconciliation but must fit within the remit of BASS* or ECRSH. You are warmly invited to participate in this biennial gathering of researchers, scholars and practitioners from many nations, and to submit abstracts for oral presentations, symposia or posters on related topics in your own academic or professional context. Please note that registration and submission of abstracts is via the ECRSH website. It asks for abstracts in the traditional ‘scientific’ format of ‘background, aims, methods, results, conclusions’. If this is not appropriate for your academic discipline or professional context, please submit an abstract in your usual style. In all cases, write ‘BASS Abstract’ at the top. Information about the acceptance of your abstract will be sent by the end of February 2018. You are encouraged to register now to take advantage of reduced rates. Registration can be cancelled in the event of non-acceptance of an abstract. To register for the 2018 conference, click here. To submit your abstract until 31 Oct 2017, click here. To visit the BASS website and read the Conference and Abstract invitation, click here. Please circulate this invitation through your own networks and to anyone who might be interested. c) the development of inclusive and respectful policies and professional practices.